“There is nothing on our desk, to seek approval or otherwise,” says a spokesman for Indigenous Affairs Minister Nigel Scullion, in response to apparent claims that the Mbantua Festival will get a further grant from the Aboriginal Benefits Account (ABA), beyond the $1.3m it has already received. The spokesman says the ABA’s advisory committee is just that – it advises but it doesn’t make decisions. That’s up to the Minister, and at this point it is not even clear whether the committee has made a recommendation. Several suppliers to the Festival have told the Alice Springs News Online that they have not been paid. Neville Perkins, chairperson of the Arrulka Business Aboriginal Corporation (ABAC), which ran the festival, said last month that ABAC had made an application for a third grant. He said this is now before Senator Scullion for approval, but Mr Perkins conceded that he had been given no assurance that the further grant, $350,000, would be approved. Mr Perkins has now sent a letter to “creditors / stakeholders” saying the Federal Government administers the ABA, and the new Minister is responsible for signing off on payments from the ABA to approved funding recipients such as ABAC”. Mr Perkins does not make it clear who he thinks “approved” the funding but seems to suggest it was the ABA’s advisory committee. Mr Perkins says in the letter: “ABAC has relied on significant funding from this source in order to stage the Mbantua Festival in October this year. “Since October, ABAC has been delayed unexpectedly by changes in the new Government’s and Ministerial timelines to finalise funding allocations to agreement holders like ABAC. “We understand the process has been further delayed by the Federal Government’s national review into Indigenous expenditure, which also commenced in October 2013. “As of 24 December 2013, the Federal Government and the ABA have advised us that finalisation of all ABA funding matters will now occur in the week commencing 6 January 2014. 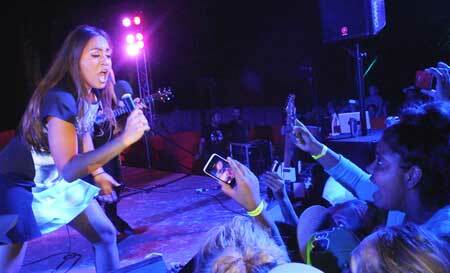 PHOTO: Jessica Mauboy, start of one of the Mbantua Festival’s big-ticket events. As someone who assisted the festival via Stuart Rotary Club I am extremely disappointed that the club is left out of pocket. What galls me is the “polly speak” you get when trying to get a straight answer. A lot of people worked hard on a voluntary basis to make the festival a success and included feeding the cast of kids that took part in the Bungalow story. My two granddaughters were amongst the cast and while they enjoyed the experience and got a tee shirt it looks problematic as to whether they will receive the promised DVD of the play. It was a great show but in future non profit organisations need to see the money first to cover expenses before ever getting involved again.